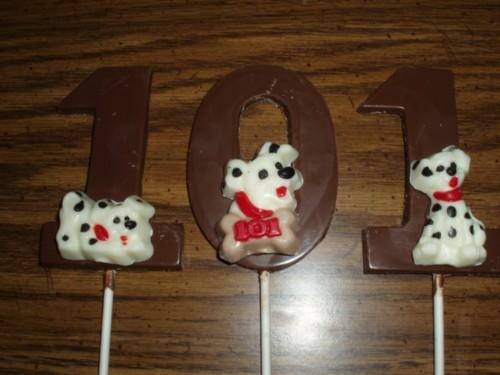 You are looking at a picture of some 101 dalmatian chocolate lollipops. These dalmatians are on the front of any number from 1-9 they are all chocolate and can be made in any colors that you choose. You may pick any of the 3 different dalmatians. You will receive one lollipop of your choice. This candy is made fresh to order and comes in bag tied with a pretty colored ribbon. These would be very cute for your childs birthday party.